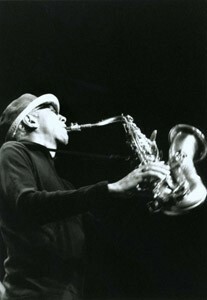 Bel Canto: Saxophonist Charles Lloyd says that he and colleague Billy Higgins 'were deeply in service' to art. Ask jazz saxophonist and flutist Charles Lloyd to comment on the creativity that has driven his music for five decades, and he'll offer a response that's both enigmatic and profound. "I'm a musician by nature. Show-biz heaven is never what called me," he says. "The music has always moved me and I feel blessed to have a song to sing. This world, as you know, is a dog's curly tail, and [longtime friend and drummer Billy] Higgins and I were deeply in service. "It's the last night of the play--whether they boo or applaud, the song must be sung." The depth of that commitment can be heard on Which Way Is East, a new double-CD that captures Lloyd and Higgins just 12 weeks before the drummer's untimely death three years ago from liver failure. Lloyd will pay tribute to his late friend at the upcoming sixth annual Healdsburg Jazz Festival (Higgins was a frequent guest at the North Bay event during its formative years). One listen to Which Way Is East--which features Lloyd's fluid sax and flute lines with Higgins' performances on trap drums, berimbau and even acoustic guitar--is enough to underscore the special relationship between these two jazz greats. Lloyd recalls, "Billy and I met when I was 18 and he was 19. We were friends and played gigs together in L.A., and then he left to go to New York with Ornette [Coleman]. I went later, in 1961. We would see each other in New York, but we didn't play together again until 1993. It was instantly clear that we had both been through a lot, we had both cleaned up [from substance abuse] and we still loved to make music more than anything. From then on, our friendship and relationship on the bandstand became tighter and tighter." Higgins dazzled fans and colleagues alike with his extraordinary talent and his youthful exuberance. "His spirit was so undiluted," Lloyd explains. "He was the music, no matter who he played with. As jazz critic Stanley Crouch so aptly put it, 'Billy gives you a tailor-made suit no matter what.' He had the ability to make anyone sound great. More specifically, his swing was out of this world, his subtlety and nuance, his élan. Billy always said that he and I had an inside thing, which lent itself to open explorations." For the final sessions, Lloyd set up borrowed recording equipment in the living room of his house and dusted off the same sax he'd been playing when the two first met as teens. "The music flowed like a river to the sea." In the decades between those meetings, Lloyd established himself as an innovator who helped usher in the world-music movement. During the 1960s, he worked as a sideman with the Chico Hamilton and Cannonball Adderley bands. In 1966, Lloyd made his debut as a leader, releasing Forest Flower and performing (and recording) a breakthrough set at the Monterey Jazz Festival in a band that featured a then-unknown piano whiz named Keith Jarrett. "We were young and fearless," Lloyd remembers. "It was a different time--the world at large was really open to new experiences. There was a lot of cross-pollination on radio, and that year we performed at Monterey. Things were in a rapid upward trajectory. We were just playing and loving every moment of it." Lloyd's fame grew and he went on to open eclectic bills for Jimi Hendrix, the Grateful Dead and other acts of the psychedelic-rock era. But Lloyd startled fans by retreating from the music scene for most of the '70s. He was sidelined with illness, spent time at the Big Sur artists' retreat studying Eastern religions and reemerged in 1996 with the critically acclaimed album Canto, followed in 1998 by the Higgins collaboration The Water Is Wide. But accolades meant little. "I'm always looking for my voice as an artist, and still finding it," he says of his ongoing quest. "My voice has always been there, but as the interior work intensifies and deepens, you can hear it in my tone and expression." These days, Higgins is still on his mind, even as Lloyd stretches out into new musical terrain. "For me, because we were so close and so in tune with each other," he says, "playing with Billy was effortless. It was flight. But I am now opening a new chapter, being able to make music with [former Marin percussionist] Zakir Hussain, which is an incredible experience. He comes from a tradition of tabla playing that goes back centuries. His father, Ustad Alla Rakha, was one of the baddest cats on the planet, and so is Zakir. Playing tabla and dancing with rhythm is in his DNA. But on top of that, he can swing in the most musical and effortless way. "So he and Higgins have that in common--and the letter h."
Charles Lloyd and percussionist Zakir Hussain perform a tribute to Billy Higgins on Saturday, June 12, at the Raven Theater as part of the Healdsburg Jazz Festival. 115 North St., Healdsburg. 8pm. $28-$45. The Healdsburg Jazz Festival runs Saturday, June 5, through Sunday, June 13. Other featured performers include the Geri Allen Trio and Fred Hersch (June 11); the John Heard Trio (June 11-12); the Carmen Lundy Quartet (June 12); and the Roy Haynes Group with Kenny Garrett and Frank Morgan Quartet (June 13). For complete details on all events, call 707.433.4644 or go to www.healdsburgjazzfestival.com.